Dr. Don Panoz in October 2017. Photo by Osajus. 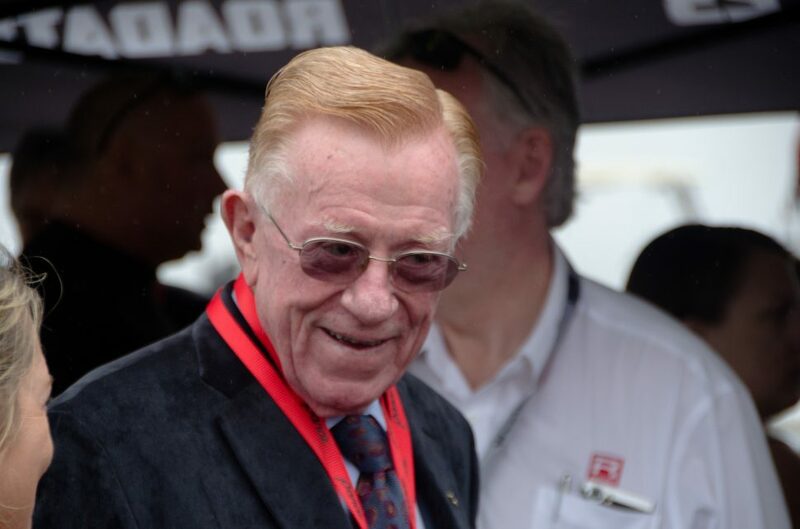 Dr. Don Panoz, best known as the one-time owner of the International Motor Sports Association, the founder of the American Le Mans Series and the driving force behind such automotive ventures as Panoz, LLC (founded by son Danny) and the closed-cockpit iteration of the Delta Wing Racer, died on Tuesday, September 11, age 83. A cause of death was not reported, though the Atlanta Business Chronicle reports that Panoz had been ill for several weeks and spent the past few days surrounded by family and friends. He is survived by his wife Nancy as well as their children and grandchildren. A serial entrepreneur, Panoz was already running a pair of drug stores while attending Duquesne University. After graduation, he founded Milan Pharmaceuticals with Milan Puskar in White Sulphur Springs, West Virginia. During his time with Milan – later renamed Mylan – Panoz lead a team that developed a time-release transdermal patch, but when Mylan refused to develop the technology, Panoz struck out on his own. In 1969, he moved his family to Ireland and founded Élan Corporation, which continued to develop the transdermal patch. One result of this research was the nicotine patch, for which Elan retains the patent today. Panoz later sold his interest in the company and while others would have been content spending their days on the golf course, Panoz, along with his wife Nancy, developed Chateau Élan Winery and Resort in Braselton, Georgia, later following a similar model to develop Diablo Grande in Patterson, California, which consisted of a spa, winery, and gated residential community. The Panozes later founded the St. Andrews Bar Resort and Spa in Scotland. Other Panoz business ventures included HydroMentia, a company that specializes in countering water pollution; Ridgewood Hotels; Trevi Health Capital, a healthcare-focused investment firm; and Fountainhead Development Corporation. 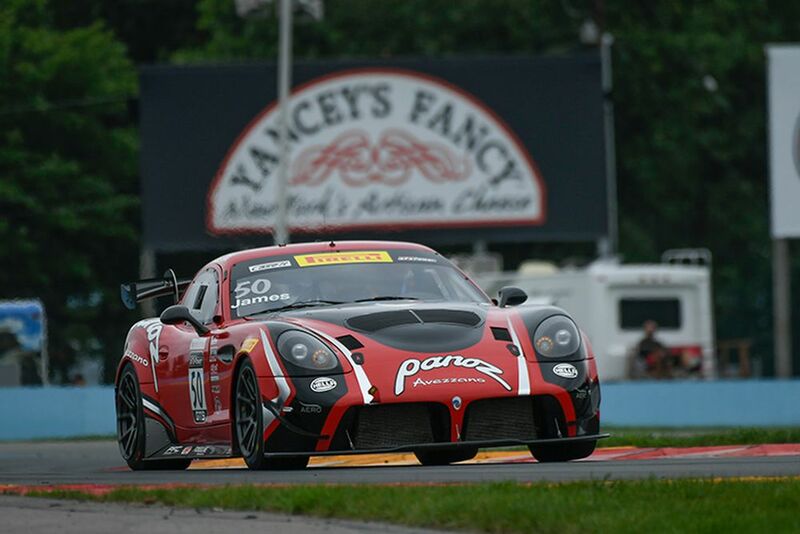 Panoz LLC’s latest racing car, the Avezzano GT4, at Watkins Glen in 2017. Photo courtesy Panoz LLC. Dr. Don Panoz came to racing and automaking relatively late in life, in 1989 at age 54, when he used his wealth to fund Panoz, LLC for his son Dan, who built a series of road and racing cars under the Panoz badge. In 1997, Panoz entered Le Mans with the Esperante GTR-1, a vehicle developed in conjunction with Reynard, which ultimately led to the roadgoing Esperante, a low-volume boutique sports and sports racing car built in Braselton. Panoz purchased the Road Atlanta racing circuit in 1996 and immediately upgraded the venue to meet FIA standards. The first big event under Panoz’s ownership was the Petite Le Mans in 1998, which was created with the cooperation of the Automobile Club de l’Ouest, the organizers of the 24 Hours of Le Mans. Based on the success of Petit Le Mans, Panoz purchased the remains of the old International Motor Sports Association in 2001, which was then known as Professional SportsCar Racing Association, and renamed it the American Le Mans Series. Panoz later owned the rights to the Sebring 12-hour endurance race. In 2012, Panoz sold Road Atlanta, along with the rights to the ALMS and his Sebring lease, to NASCAR, which again operates its sports car racing venture as IMSA. Under the aegis of Élan Motorsport Technologies, in 2002 Panoz purchased G-Force, the successful Indy Car chassis manufacture originally founded by Chip Ganassi and Ken Anderson. With a redesigned chassis, dubbed the Panoz G-Force GF09, the team scored victories at the Indianapolis 500 in in 2003 and 2004 with Team Penske and Rahal Letterman, respectively. But the car was never competitive there again, and Élan shut down the G-Force program a few years later to focus on development of the DP-01, which was a chassis built for ChampCar. Unfortunately for Panoz, the DP-01 debuted in 2007, and though the car was an advancement over then-current ChampCar chassis, the series soon merged with IndyCar and the DP-01’s final race was the ChampCar finale at the 2008 Long Beach Grand Prix, which consisted of a field entirely running the DP-01. In 2002, Élan purchased the Van Diemen operation, a very successful maker of formula car from Britain. The Delta Wing coupe in 2013. Photo by Nicholas Sladeczek. In more recent years, Panoz took over the Delta Wing Racer Project, converting the car from an open cockpit setup to a closed one. He also founded Green4U Technologies to build an all-electric prototype capable of competing in the 24 Hours of Le Mans, a project that never came to fruition. But Panoz still tasted success in his final years as the Panoz Avezzano GT4 captured the Pirelli World Challenge GTS Sprint and Sprint-X manufacturer’s championship in 2017, its debut year.